Heritage Toronto invites local residents to explore the malty brewing history of Old Town Toronto. First introduced last year, this tour got rave reviews from participants, who enjoyed the walk around Old Town Toronto & Corktown. 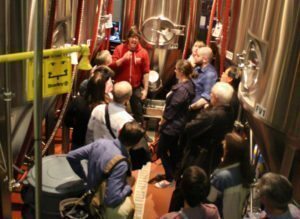 Led by noted beer expert Jordan St. John, the tour explores over 200 years of Toronto’s brewing history and includes a beer tasting (presented by Mill Street Brewery). All monies raised from the ticket fees go to support the work of Heritage Toronto – a charitable agency of the City. The 1.5 hr tour is offered on 4 dates this year: May 25 (6:30 PM), June 18 (1:30 PM), July 27 (6:30 PM), and September 10 (1:30 PM). Explore Toronto’s rich and malty brewing history on this tour with noted beer expert Jordan St. John, author of Lost Breweries of Toronto and The Ontario Craft Beer Guide. Learn about the heritage breweries of Old Town dating back to the early 1800s, some of which still exist today. Tour will end with a beer tasting presented by Mill Street Brewery.